The electrochemical reduction of oxygen was investigated on carbon nanotube (CNT) electrodes in alkaline and acidic aqueous solutions. The CNT-based electrodes were produced by means of chemical vapor deposition (CVD) technique with decomposition of acetonitrile (ACN) and benzene (BZ) carbon source materials in the presence of catalyst. Namely, upon decomposition of ACN and BZ, nitrogen-doped and pristine CNTs, respectively, were produced. 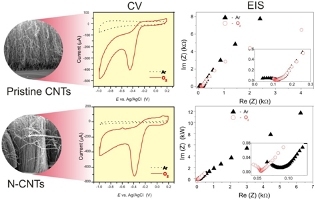 The electrochemistry experiments were performed by means of cyclic voltammetry (CV) and electrochemical impedance spectroscopy (EIS) in Ar-protected and O2-saturated aqueous solution of KOH and H2SO4. For comparison reasons, the electrochemical experiments were also performed on epitaxial graphene deposited on SiC as well as on conventional Pt, Au, and glassy carbon electrodes. The obtained results demonstrate that the strong doping with nitrogen of low-dimensional carbons is the best strategy to obtain an efficient metal-free catalyst for the oxygen reduction.